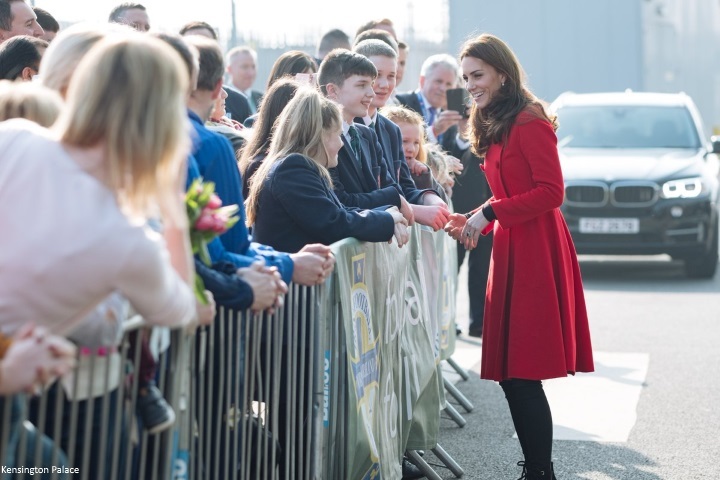 Duchess Kate: The Baron and Baroness of Carrickfergus Begin Two-Day Visit to Northern Ireland! The Baron and Baroness of Carrickfergus Begin Two-Day Visit to Northern Ireland! The Baron and Baroness of Carrickfergus arrived in Belfast this afternoon for a surprise two-day visit to Northern Ireland. The couple returned to London over the weekend following a week at their Norfolk country home Anmer Hall where they spent half-term. Kate was spotted at a luxury spa last week with George and Charlotte. In her article for the Mail, Rebecca English reported: "Wearing a maroon swimsuit, she tried to blend in amongst relaxing couples but onlookers quickly spotted the family during their half-hour splash about. Kate apparently organised swimming races for the children and afterwards they practised little dives off the side. The royal trio then all went into the sauna and steam room. Apparently George, naturally, won all the races. They said: ‘He was swimming front like a dog paddle style and jumping in from a squatting position the side. Charlotte was doing sitting dives. She was squatting on the side with her arms up in dive position, she kept saying "Look mummy I’m diving in". Kate was very encouraging. At one point George went under and Kate had to grab him, he became a bit tearful and clung to her but then he soon went off again.’ Neither the little prince and princess had arm bands on and were ‘super confidant’ in the water. " For security reasons, royal visits to Northern Ireland tend to be kept under wraps until the day they are due to begin. William and Kate have made several day visit there since 2011, I've been hoping they would return this year for a lengthier trip and was very pleased to see news of an overnight stay. Over the course of today and tomorrow, they are visiting Belfast, Fermanagh and Ballymena to celebrate young people. 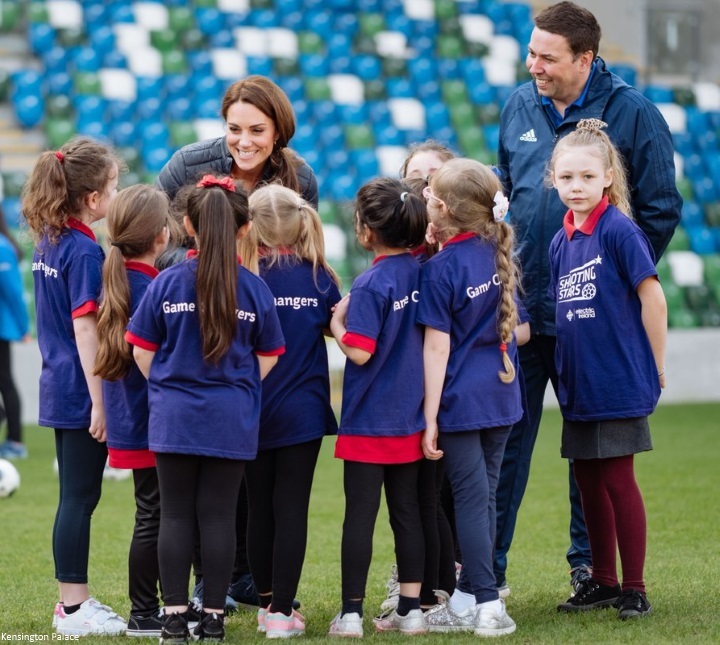 Kensington Palace said: "Day one will have a strong focus on the positive impact that sport, nature and the outdoors can have on childhood development, and improved physical and mental health for all." Their first port of call was Windsor Park football stadium, home of the Irish Football Association (IFA). The couple were greeted by local well-wishers upon arrival. 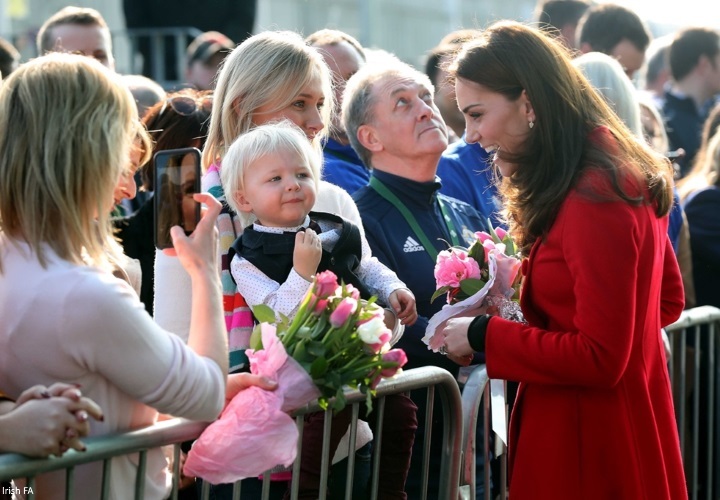 One little boy, wearing a waistcoat and bow tie, caught Kate's eye in particular. She laughed when he stuck his tongue out. Prince William greets a group of young people. 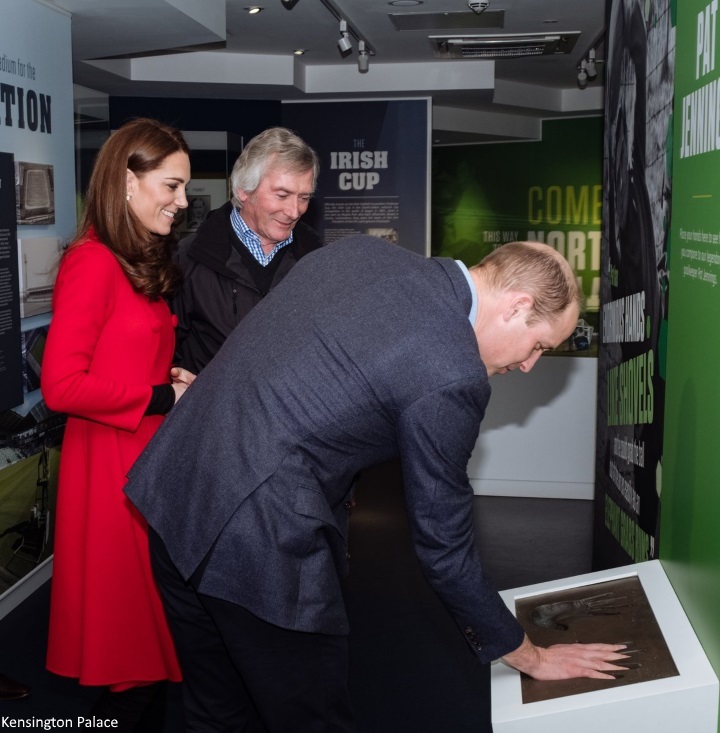 William and Kate toured the Irish FA’s Education and Heritage Centre. 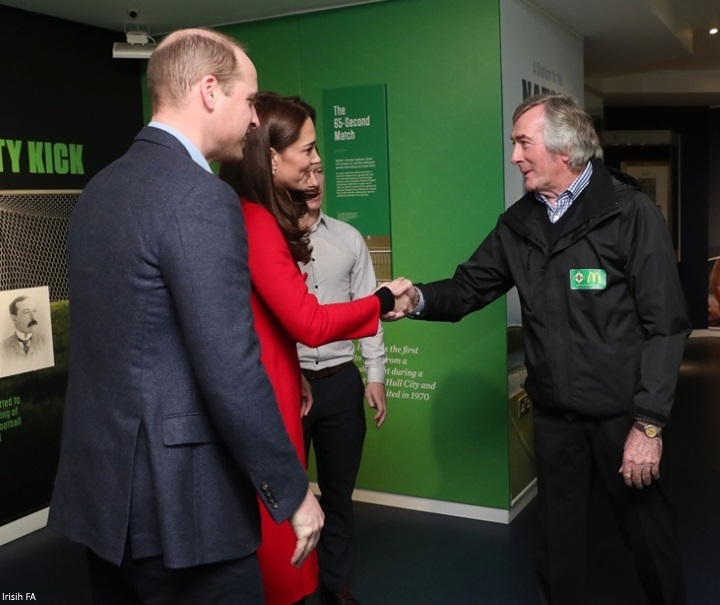 William and Kate were welcomed by former Northern Ireland footballer Pat Jennings OBE. Mr Jennings played 119 games for Northern Ireland as a goalkeeper, a figure which at the time was a world record and is still a Northern Ireland record, in an international career which lasted for over two decades. 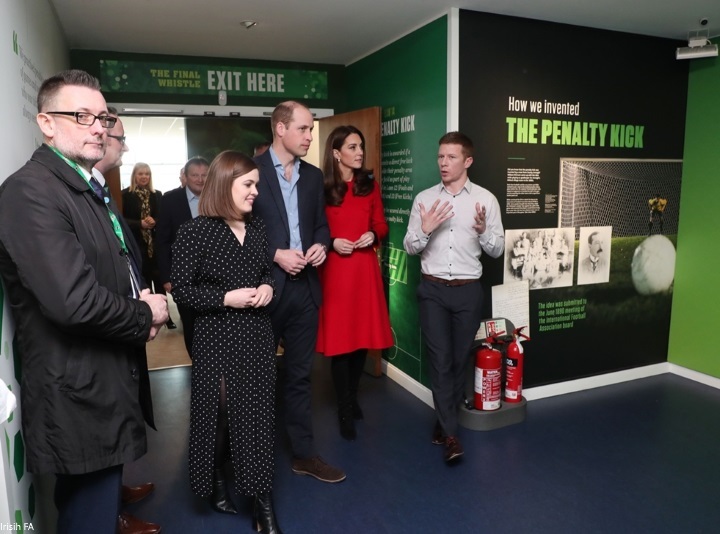 They saw how the facility tells the unique story of Northern Ireland football using a variety of media and interactive displays. 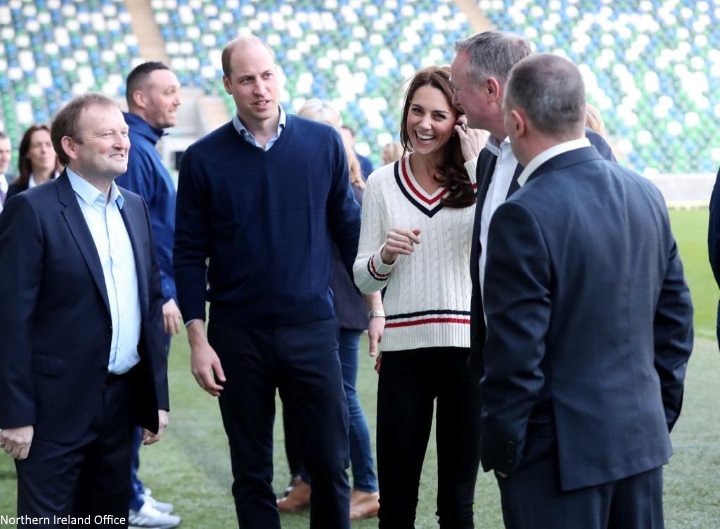 Irish FA Director of Football Development Michael Boyd said: "It was a fantastic privilege to welcome the Duke and Duchess to the National Football Stadium at Windsor Park and to tell them about the work that the Irish FA Foundation does promoting football for all, health, education and employability serving communities right across Northern Ireland. 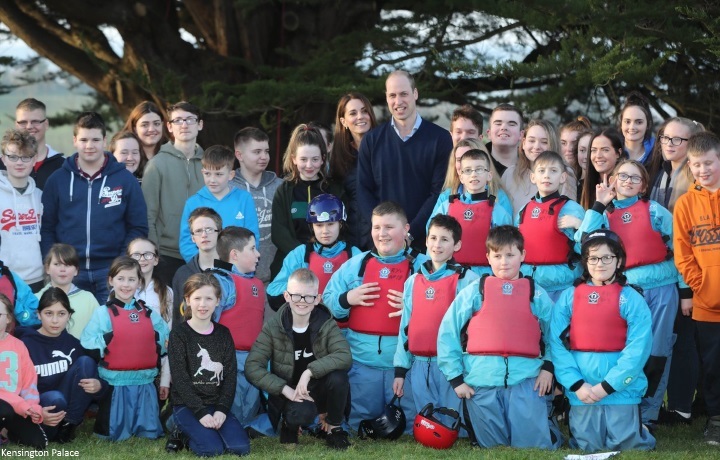 The Royal couple were really interested in the projects we deliver, and it was a massive boost for our staff and our participants to meet them and to be encouraged by them." 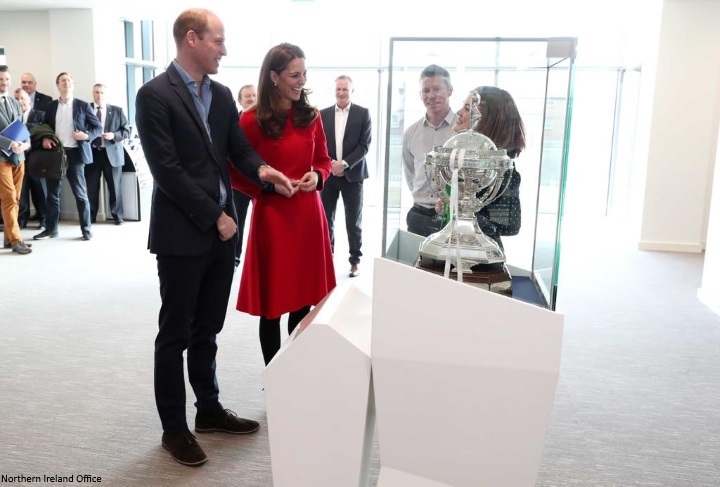 They viewed the British Championship trophy, won by Northern Ireland when it was last played in 1984. The Baron and Baroness watched primary school children from across Belfast take part in some of the Irish Football Association Foundation’s award-winning initiatives such as the Shooting Stars programme, which promotes football participation for girls aged between four and seven, and the McDonald’s Fun Football programme which is aimed at encouraging kids of all ages to play the game for the first time. The Shooting Star programme aims to help girls learn through play, make new friends while developing the fundamentals for football. It is an exciting new project that can benefit local clubs also through coach mentoring/ volunteering opportunities in this age group. Kate asked the group about their experiences. Sporty Kate got into the spirit of the game. A great photo of the couple. They were both very much in their element. Enjoying plenty of fun moments on the pitch. 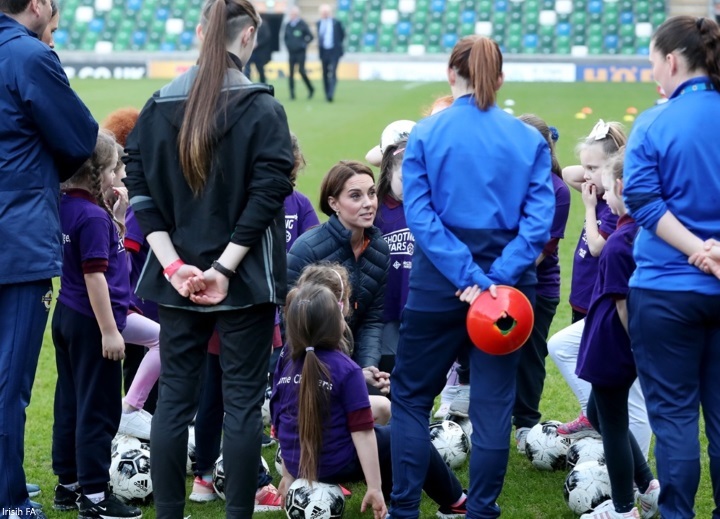 The Duchess joined girls aged four to seven, who were taking part in a Shooting Stars programme to encourage young women into football. “Do you like doing sport?” the Duchess asked a group of them, crouching down to their level. “Thank you so much for letting me play. 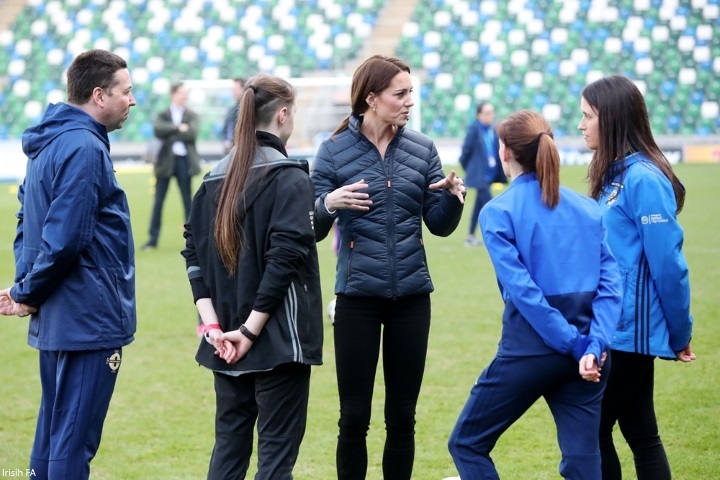 William and Kate learned about the Irish FA’s ‘Stay Onside’ initiative which uses sport to divert young people away from criminality and offending. 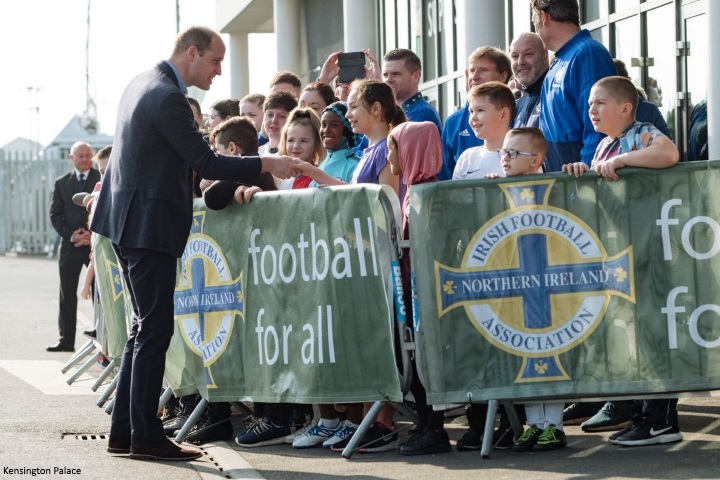 They met a number of officials and representatives from Irish FA including President David Martin who said: "This was a very special day for the association and for the football family in Northern Ireland. 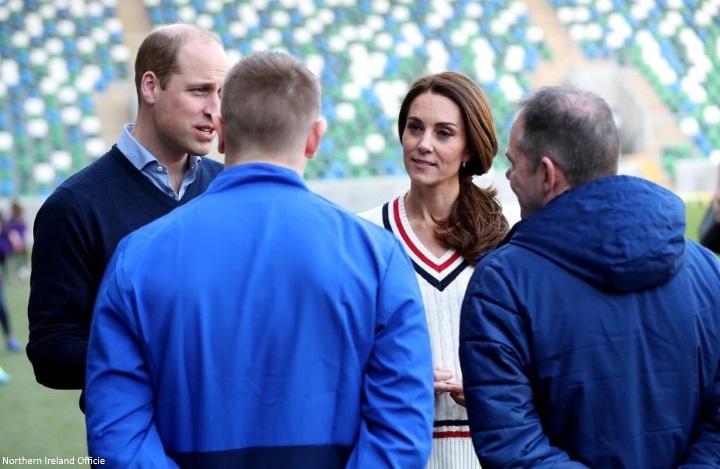 The fact that the Royal couple asked to come to the National Football Stadium and to see the work of the Irish FA first-hand is a tremendous endorsement of the programmes our staff deliver.". Before leaving, they met participants in the FA's 'Ahead of the Game' mental health initiative which supports clubs and volunteers by focusing on challenging the stigma and introducing preventative measures. The video below has excellent footage from the engagement. They were given green jerseys for George, Charlotte and Louis by three youngsters. 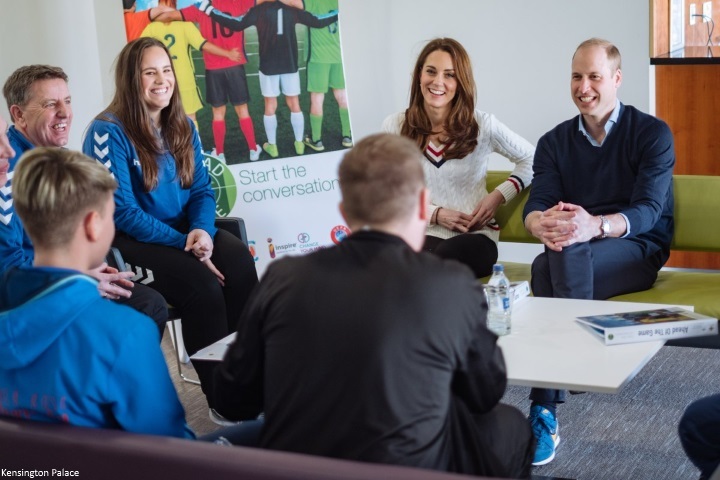 William asked the children if they enjoy football and Kate replied: "They were teaching me some football skills, they're very good". William and Kate then travelled to Fermanagh for their next engagement. They visited the charity Extern at their Roscor Youth Village, which is a residential activity centre for children referred to the charity by social workers or the Department of Justice. 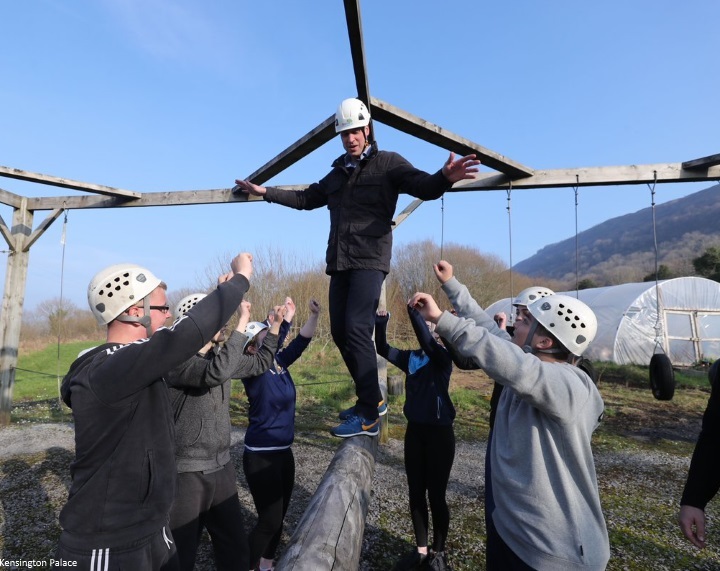 The site provides a safe space to help and support these young people, with particular emphasis on outdoor activities and developing independent living skills. Kate joined a group of teenagers for archery. William tried several activities. This is one of the best photos from the visit. 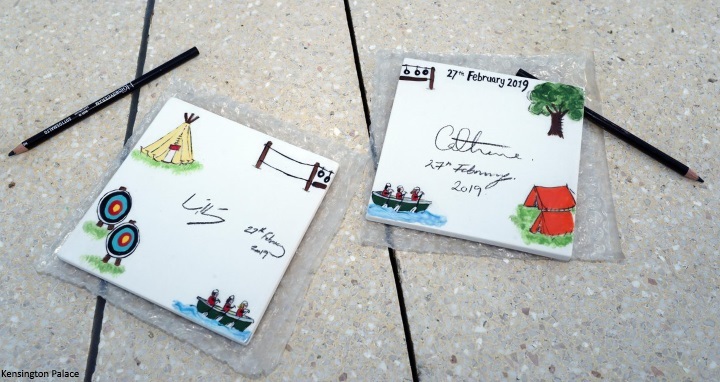 William and Kate signed tiles which feature designs from 40 young people. There was a spot of friendly competition between the couple during a canoe race. Prince William's team was victorious. A video from the outdoorsy afternoon. The Duchess sported two looks for the day featuring a mix and match of new and repeated pieces from her wardrobe. The Duchess wore her red Carolina Herrera coat, first seen in Canada in 2016 and worn again for a Rugby match in Paris in 2017. The double-breasted red coat features a peter pan collar and is made of a double-faced wool and a cashmere mix blend. It retails for $1,915 and is only available in store. The Duchess wore her L.K. Bennett Marissa boots. The £295 boots are described as a "classic style featuring four eyelet lacing, an almond shape toe and a high block heel. Marissa is the perfect boot for dressing up the simplest of winter looks." 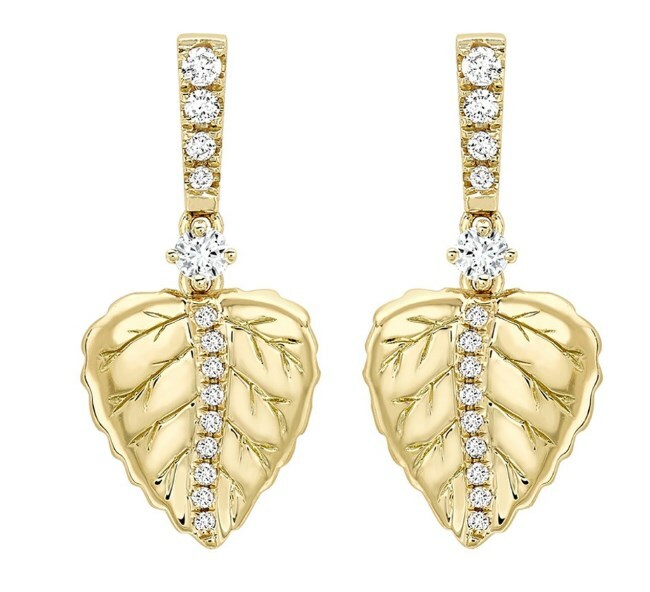 Kate accessorised with her Kiki McDonough Lauren earrings. 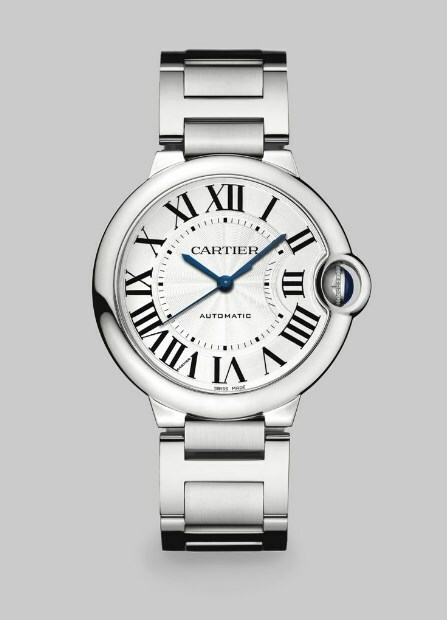 Kate wore her trusty Cartier Ballon Bleu watch. 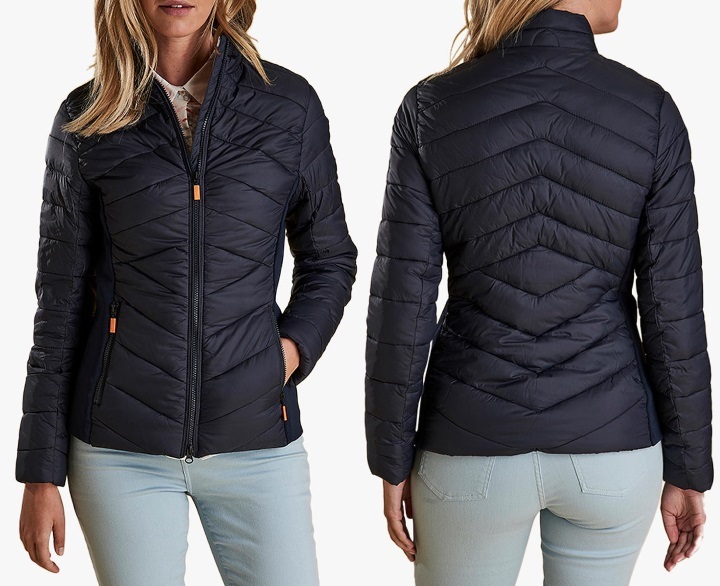 For a more casual look, Kate changed into the Barbour Longshore Quilted Jacket. The £159 piece in navy/marigold is described as "The ultimate utility jacket, this piece from Barbour is designed with a funnel collar to keep out the chill, exposed zip front fastening and doubled up pockets on either breast panel. The curved hem softens the structure." It's available at John Lewis and Next. 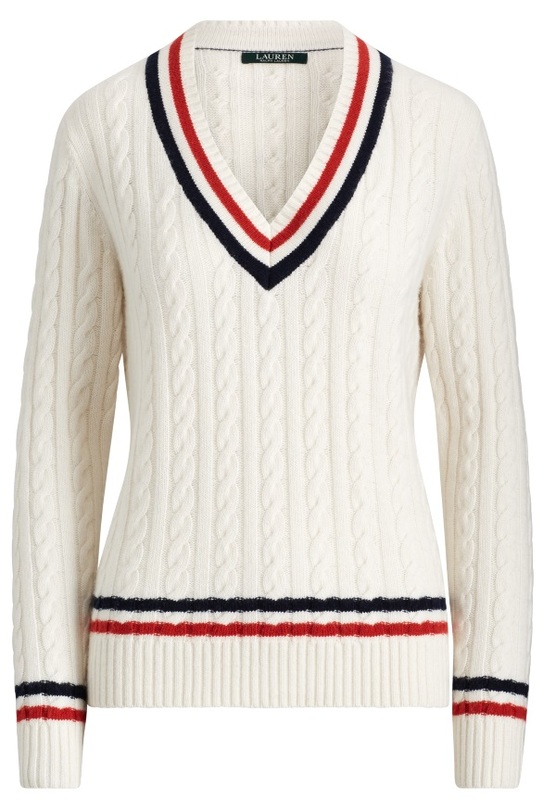 Kate's sweater is the sold out Ralph Lauren Cable-Knit Cricket Sweater (with thanks to Bojana). And Kate's new trainers are the Sweaty Betty x New Balance Fresh Foam Cruz style (with thanks to Middleton Maven). Later, William and Kate will attend a party in Belfast celebrating young people who are making a real difference in Northern Ireland. What a fun surprise for us! And what a big event for them. It's not an easy area for royals considering the past but also the current discussions and issues. So I'm proud and interested in these days of events. Good look as well. Very nice coat so am glad for the repeat. Like the jeans and boots with it as well! And no rest for Charlotte! Probably thought you had some downtime for a few days but no such luck!! Thank you for your hard work as always! Ditto to all the above! This is quite the surprise! Wishing them a great trip. Now, I understand this mix matched outfit! Yay,I was waiting and refreshing the blog all day because I know her pattern by now. Every week since September 2017 that is not a holiday or a sickness leave(pregnant , maternity leave and all) she would have engagements in Tuesday , Wednesday and Thursday.Thanks for the blog Charlotte and the coverage. What a nice surprise! Glad to see them in that particular area! Kate looks good as usual. Nice red coat. I'm curious to read more. Bravissima Charlotte! Kate looks like she is having a great time! Love the how she has dressed to go smoothly from one event to another. Love the contrast of the boots and the swingy red coat which is absolutely gorgeous. What a lovely surprise!Kate looks gorgeous in red. Oh wow! Wonderful! This will be fun. What a nice surprise to read this post while sitting in a doctor's office waiting on test results. Kate looks happy and engaged, always great to see her big smile. I'll let her dazzling smile help me overlook the awkwardness of the button placement on the red coat, which hasn't gotten better since the first time she wore it. So happy to have some surprise engagements, but oh how I hate those boots. Just not my taste. I do, however, love those black jeans. Have we seen them before? They're a really nice dark black. Looking forward to more! Was thinking the same thing...I hate these boots. They're not very appealing to me either. Fun surprise for all of us. I LOVE this jacket and boots. Perfect. She looks happiest when doing athletics. She looks perfect. I really like the red CH coat, but not with the jeans (jeggings?) and boots. It looks too dressy for the casualness of the boots and trousers. But, I really like the sporty/casual look with the sweater. Nice surprise to see a mini tour this morning. I can see what she was aiming for with the quick change. But she picked the wrong coat from the Royal Coat Museum. She needed something a couple of inches shorter and with a bit less swing. (And we all knownshe must own something that fits the bill) This one just looked too much like a dress over pants. They look so relaxed and in tune with each other. William is very funny and seems to crack the Duchess up. She has a beautiful smile and good sense of humor. She has grown into the role with confidence, poise and seems to enjoy herself. She has a good sense of who she is. 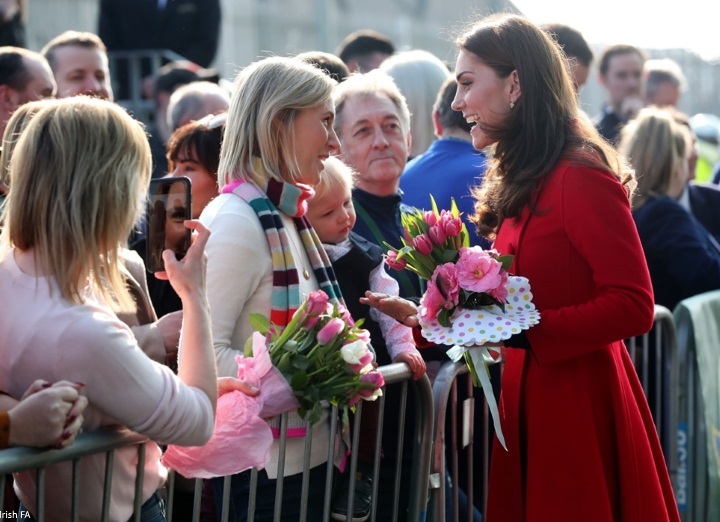 Many readers have mentioned how confident & comfortable Kate has seemed since coming back from maternity leave this time around. I've noticed it, too. I feel it's a combo of her growth over the years, possibly feeling that their family is complete with the arrival of Louis, finding her groove with motherhood, & also with William being around more in terms of not working those grueling hours as a search & rescue pilot any more....just me wondering aloud! I'm just really happy for them & their spot in life right now. I also get the feeling that before the move back to London she saw herself as a stay-at-home mom who does a few royal things. Now she looks like being a royal is her job. Like she is not spending weeks putting together the perfect outfit, but rather looking at what she have in her cupboard that will work for a specific event. @ Rachel: I completely agree with your thoughts! Being a new mom is hard enough & with that comes a sort of confusion of identity/self for a while. I believe Kate has now settled in nicely. The arrival outfit is a miss. Understand what she was trying to do with the later engagement but agree different boots and a different jacket. The coat loses its more "dressed" up look with the pants so the point of wearing a dressier coat is lost with those pants. A different style jacket or blazer would have still been dressier but still have been a better match with the pants. The sweater and pants are cute for playing sports and look good. She did. Love the sweater. Completely agree! The dress in it's original outing was perfection, but with the legging/pants and edgy boot it is a miss for me. The casual nature of the pant and boots make the coat dress look frumpy. A shorter jacket would have done the trick. So happy to see them out! Love the narrative of the pool visit over their break. Good for them. Agree - the boots and the coat have completely different vibes. That can sometimes work but not here. The coat just looks outdated to me, instead of sophisticated (which is how it has looked in the past). Love it when she's sporty and even though I think skinny jeans have had their time and should be making their way out of our closets she does look amazing in them and they're working here I think! I just love surprise appearances by the Cambridges! I was beginning to go into withdrawals. I love that red Carolina Herrera coat and those boots are to die for!!!!! 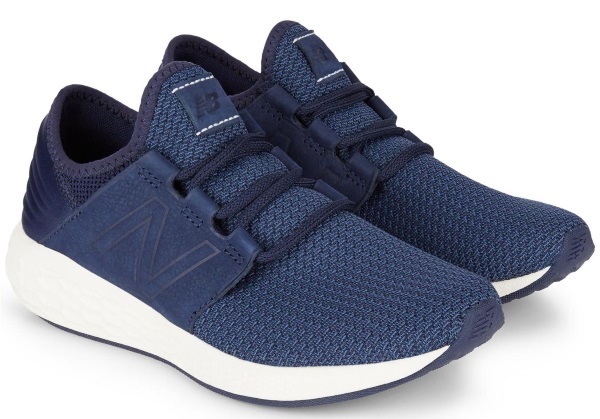 Hello, do you think there are differences between this NBxSweaty Betty sneakers and the ones on the NB sites with the same name? I would love to buy them. Thanks. She is so beautiful and radiant but what's going on with her tights/pantyhose? and these ugly boots. She's wearing her skinny jeans. My guess is she only changed her coat and shoes for the other event. I want those booties so badly, but they are out of stock in my size and a little too expensive for me anyway. Does anyone know of a decent looking less expensive replica? I see that LK Bennett has a similar looking Mollie, but I am really looking for as exact a replica as I can find. Thanks. I'm not sure which I despise more, these LK Bennett boots or the floppy Stuart Weitzmans that Meghan has been wearing. Yuck yuck yuck. I love all the rest of what she's wearing although a more tailored coat would have been better with the jeans - maybe the blue Philosophy one? I Love these boots! They’re quite edgy for her, she usually plays it much safer, it’s nice to see her wearing something trendy. I couldn’t even teller first glance that she had the black jeggings on under the coat. I’ve never been a fan of the jeggings for sporty events, but she still looks amazing. I'm so happy to see them together. Duchess Kate looks radiant in all things. The Duchess looks lovely in the red coat, but I don't like the black pants/leggings or the boots, personal preference of course, her casual wear YES. Lovely to see them both out and about. I have that sweater! You can't go wrong with Ralph Lauren, imo. Sporty Cambridge (or Carrickfergus) events are always nice. I still crack up if I ever come across the picture of Kate watching William try archery in Bhutan. Seeing Kate in her red coat and those funky boots just makes me smile. She looks just great, and very unexpected combo from what one normally expects from her. The swirly coat in the happy color just makes it all fun. Really enjoy seeing Kate introduce more sassy and trendy items into her wardrobe that is a break from her impeccable princess look. The great thing is, she's still wearing a princess coat, but the whole look is out of her usual box. sigh........... I'm over the moon this morning with this post. I love these two. I love the video of Kate and William playing soccer with the kids. I can see them doing that with their own kids. I like the sweater/jeans/sneakers. I love the red coat, but am still on the fence about the boots. I do like that they are a little unexpected for her, but I'm not sure I really like the look. I'm hoping they will grow on me. 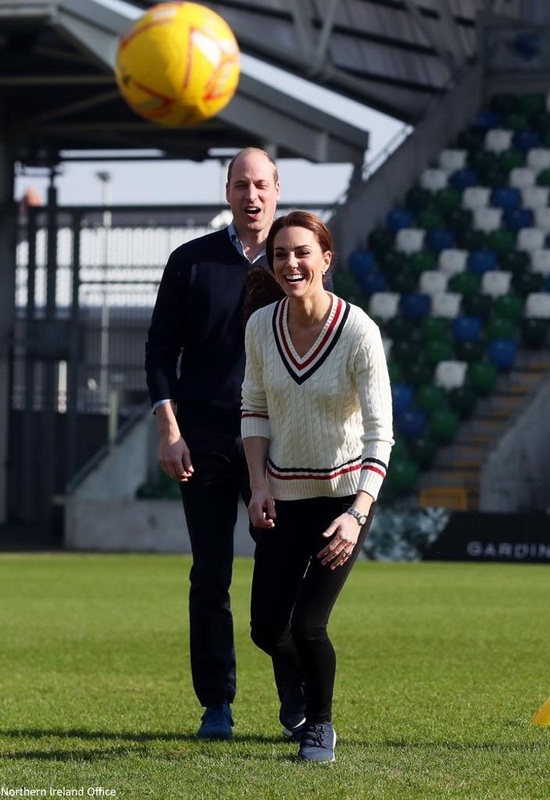 I also love the interaction between William and Kate on the soccer field, as I think that is probably how they are in private. They make a great couple! Sporty Kate for the win!!!! What a wonderful surprise. I love Catherine in the color red. It’s a color I wish I could wear. They look like they are having a great time. Lovely to see William having so much fun! An activity for the memory books for all the kids! So so so happy to see the Duchess again! She looks fantastic!! I really prefer the red coat with the black that she wore today, it looks great. Her hair looks great too. They both look really happy. Love them! I loathed this coat on it's first wear but I like it with jeans and these boots. It takes the prissiness away. I hope somebody can help me out here by explaining this. This mini-trip was kept under wraps for security reasons - very understandable. But then how did the people hanging around for the walkabout find out about it? I am confused. She also met Kate one other time and has that and meeting Meghan in her stories too! For some reason, this is the most refreshing royal post I have seen in a lon time. Love the outside activity. Sports and being outdoors are good for the soul. No matter who designs the clothing. There has been such a preoccupation with beauty and designer clothing and appearance and I find it unhealthy. 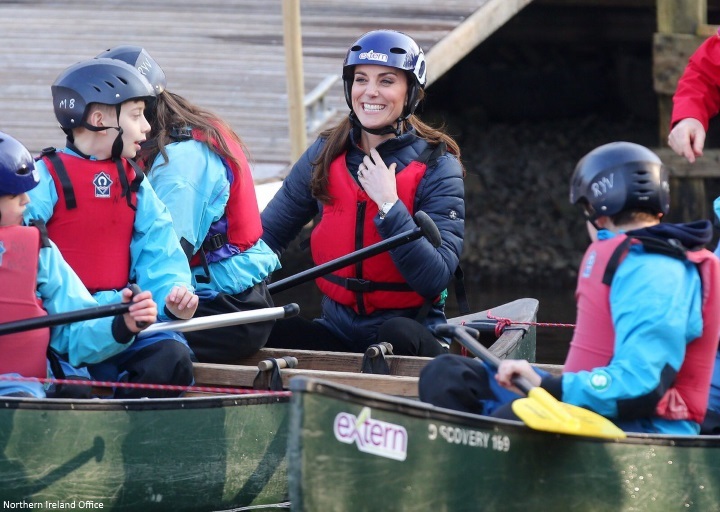 I love it when Kate gets involved in sport and other outdoor activities, especially with kids! She looked fabulous today, and really in her element. How lovely to see this casual Kate! She's so slim, sporty and playful. She looks very pretty in her ponytail. 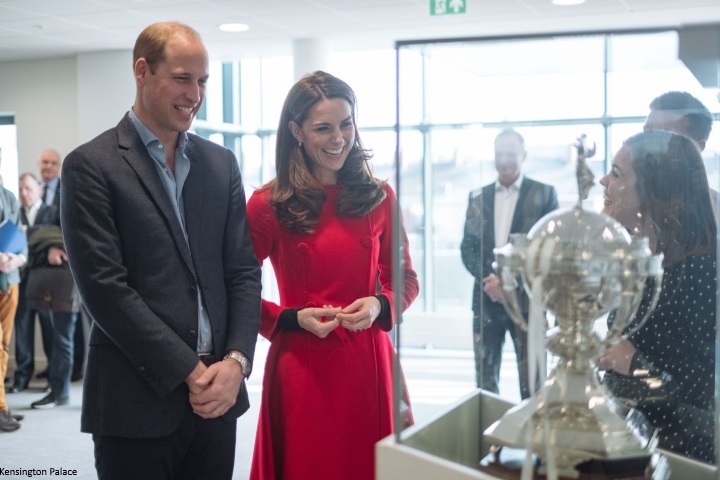 And I love the photo where she is leaning on William. The Queen can officially knight her as the Children's Princess. It's so lovely to see. Question: how do the crowds know to be there, since the visit is kept secret? First quick look, great photos of them. They both look terrific, and seem to be enjoying this trip. I certainly appreciate all the outdoor activities that Kate participates in. She is being SUCH a good role model in that way. The Duke and Duchess of Cambridge are both in their element: Sporty, for sure. A focus on helping young people, IMO, is always a fantastic cause to support. Thanks for all the background info. Very good, Charlotte. she looks lovely what an incredible figure she has! love the nice red coat she shines in red! i love her updo. her casual look is great and i love to see her beautiful smile and to see how happy she is! Starting the day with such smiles and laughters! I love the Cambridges! What a great surprise! My husband gave me that very same Ralph Lauren sweater for Christmas. Beautiful! What a lovely couple!